Easily to bring your serial equip. into Ethernet. A stand-alone AI device integrates with CPU, OS, full version TCP/IP Protocol. Transfer data transparently between serial equip. (RS232/422/485) and Ethernet. Gateway and Proxy server supported, easily brings your serial equip. into Ethernet. Dual direction transparently data transfers between serial and TCP/IP, Integrated with ARP, IP, TCP, HTTP, ICMP, SOCKET, UDP, protocols, English interface with user friendly design, setup wizard is also available. Plug and Play with current system. English interface with user friendly design, fits all your industrial needs. 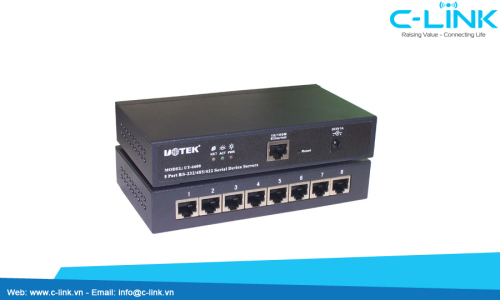 8 serial ports, easy to connect your DTE, modem, Barcode reader& printer, POS,ISDN, Adapter, serial printer, and all common serial equip. Based on Windows COM driver, with easy-to-use software, support Max.1024 COM port. Under this working mode, the serial equips which connecting to UT-6600 is easily to be project as COM in Windows. Just Plug and Play, no more modification required with current system.